Kalospectra Group Art Show I'll be in Tomorrow Night in Richmond! Kalospectra Group Art Show I'll be in Tomorrow Night in Richmond!, originally uploaded by Liquidmethod. 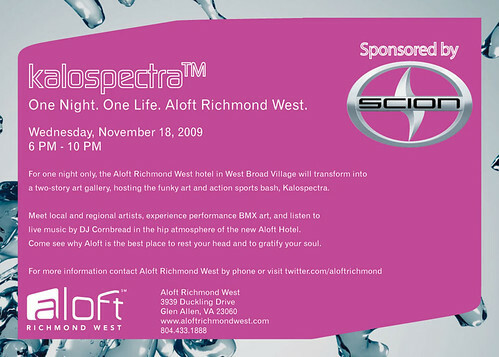 On Wednesday, November 18, from 6pm-10pm, the Aloft Hotel in the West Broad Village of Richmond, Virginia's West End will transform into a two-story art gallery, hosting the art and action sports event, Kalospectra, sponsored by Scion. Meet local and regional artists, witness performance BMX art, and enjoy free live music by DJ Cornbread in the hip atmosphere of the new Aloft Hotel. This event is FREE and open to the public! Come see why Aloft Hotel is the best place to rest your head and to gratify your soul.